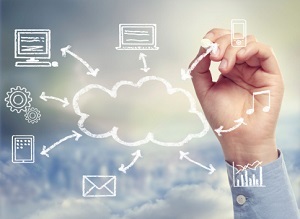 What Role Do Technology Providers Play in Cloud Computing? Not long ago, cloud computing was little more than a buzzword. The concept of the cloud has existed for at least two decades, though the ability of technology to fully support cloud computing has lagged behind the concept itself. However, cloud computing has become mainstream as technology service providers and businesses embrace the necessary infrastructure and support services to implement an effective cloud strategy. As companies continue to search for infrastructure, software and application services, technology service providers respond with programs, hardware and solutions that allow companies to streamline operations and refocus their IT departments’ efforts. Read on to discover the role service providers play in implementing and managing cloud computing. Enterprise solutions require significant financial investment and a robust, qualified IT department to support operations and services that keep a company’s network accessible and secure. Cloud computing services provide companies that are unable to accommodate the steep financial investment access to this enterprise-level technology. The most common solutions offered by cloud service providers include Software-as-a-Service (SaaS), Platform-as-a-Service (PaaS) and Infrastructure-as-a-Service (IaaS). Simply defined, SaaS (Software as a Service) occurs when a provider deploys software over the Internet. SaaS represents the simplest cloud solution available. The cloud provider is responsible for installing the program on servers, providing access to those servers over the web and maintaining the software. Multiple people can access the same program from the cloud service provider, which manages the program from a central location. Common examples of SaaS include email services and tax and billing programs. Businesses utilizing SaaS cloud computing don’t operate the various layers of the program – this is the role the technology provider fulfills; the business simply uses the applications via the web. Next, let’s look at IaaS (Infrastructure as a Service). Rather than purchasing servers, software and other network equipment, a business “rents” all of the equipment and access from a cloud service provider. In the case of IaaS, the role of a cloud service provider is to offer resources and support, rather than simply software or access to creation platforms. IaaS is ideal for businesses not only because of its affordability, but it is also easily scalable. Businesses can pay for and access services as needed. You’ll never be stuck paying for resources you don’t need or use. The final layer of cloud computing is PaaS (Platform as a Service). This service is applied in the world of software development. Instead of providing a company with software programs over the web, the cloud service provider offers businesses a platform to create software programs that are accessible over the web. A perfect example of PaaS in the modern business climate is the Google App Engine. Google does not provide a company with a software service that is used in-house on a daily basis. Instead, businesses have access to a platform that allows a company to create apps; in this case for consumption by consumers. A technology providers’ role is to ease the burden on IT staff and company finances – and the same can be said for cloud computing. With a cloud service provider fulfilling the role as a software, platform or infrastructure provider, the IT department is free to focus on their priorities and achieving business objectives. To more fully understand the benefits a technology provider can offer to your business, request a discussion with an advisor.